Order The Galaxy Nexus HDMI Dock Through The MyVerizon App? If you really need to try and get your hands on the HDMI docking station for the Galaxy Nexus which we just showed off earlier, you can try and place an order through the MyVerizon app. 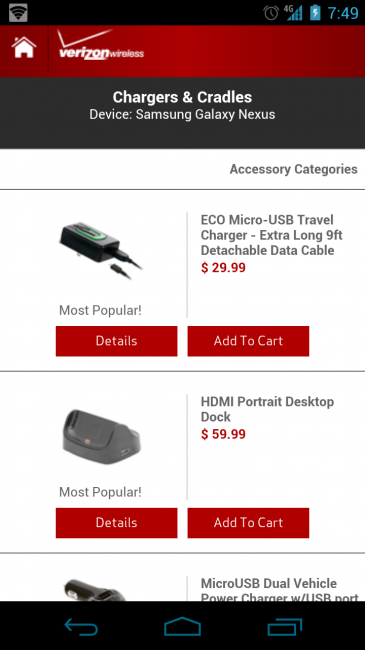 Thanks to a reader’s tip, if you scroll through the available accessories on Verizon’s mobile site through the MyVerizon app, you will be able to add the dock to your cart and then purchase it. We have already received email confirmation, but we have a feeling it will be cancelled by Big Red. For a while now, we have seen the dock on Verizon’s site, listed as Out Of Stock. Verizon’s mobile site may not reflect this. So if you happen to order the dock which goes for $60, then cross your fingers that you will receive tracking info as well. If not, Verizon will cancel the order and we are back to square one. Note: Also, feel free to try this link which will take you straight to the mobile site.